Three days ago my partner greeted me at the door with a grin and the words “I’ve got a present for you”, I was immediately suspicious as ‘present’ has become a code word for ‘lots of work’ in our relationship. I came inside to find an ominous looking box on my desk with a tiny bit of fabric sticking out the bottom. When I opened the box I found the little fellow below nestled on a t-shirt (begging questions about Kev’ driving around shirtless). 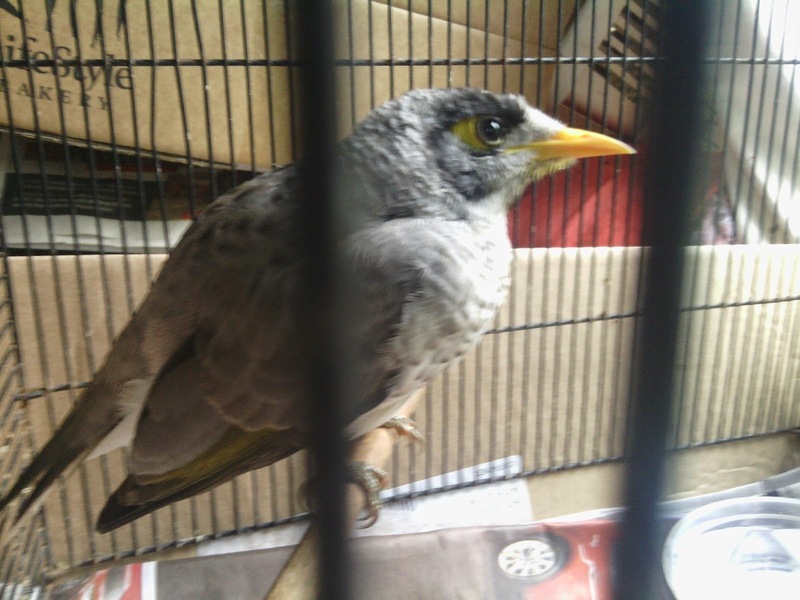 He (I’m assuming his gender) is a noisy miner; a bird native to this area, although not around the humpy. He coped with a close up inspection fairly well and I discovered a slightly damaged wing on the left side and a slightly more damaged hip on the left side. As he was picked up on the road (sitting like a stunned mullet, according to Kev’) I assume he has been clipped by a car. He can grip a perch with both feet, but sits with one leg off to the side. I am hoping he has no broken bones, and after three days he would be dead by now if he had any (gangrene sets in fast). Noisy miners in the wild eat nectar, pollen, fruit, insects and occasionally a little lizard. I am feeding him a mix of fruit smoothie with added insectivore mix that we keep in the cupboard for emergencies, I also add one drop of pentavite (liquid vitamin). When I can, I will add some nectavore mix (lorrikeet food), but at present I have none in stock. He seems to love the mixture. I went out and collected some white ants for him too, which he had fun playing with, but didn’t eat. When he can put all his weight on his leg and fly around we will begin the long process of re-assimilating him into the wild; probably at my parent’s house where there is a family in residence, although their complicated flocking behaviour means that he will not be accepted if he is a she; apparently the females maintain fairly rigid territories which do not overlap while the males wander about in gangs, joining new gangs on a random basis. This little man needs a name for the (hopefully) short time he will be with me; any ideas?